The Marco Institute hosts a number of language reading groups for faculty and students. The Latin Sight-Reading Group is the most regularly occurring of these groups, but members of the Marco community are encouraged to create new groups as they wish. Such impromptu groups in the past have included languages like Old French and Old Scots. The Medieval Latin Sight-Reading Group meets weekly in 615 Greve Hall. The group reads a wide variety of texts, including treatises, sermons, saints’ lives, poetry, and charters, from late antiquity through the Renaissance. Participants are invited to bring in texts that they are working on or that just interest them. Graduate students and faculty of all skill levels are welcome to participate. For more information, contact Professor Maura Lafferty (Classics) at mlaffert@utk.edu, or email marco@utk.edu. 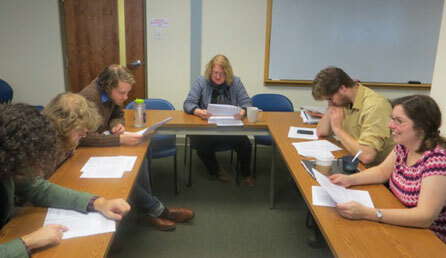 This group, led by Dr. Anne-Helene Miller (MFLL), met weekly to read Old French texts together. This reading group read the Anglo-Saxon metrical charms found is MS Harley 585 and MS Royal 12—The Lacnunga and Bald’s Leechbook. Members looked at the interaction between Celtic and Germanic elements within the charm tradition, producing a new edition with commentary. Met biweekly to collaborate over reading Old French epic literature.